A storm packing heavy rain, lightning, and 70 mile-per-hour straight-line winds hit my town this weekend, tearing up trees, tearing down power lines, and tearing a bronze statue off the top of the county courthouse where it has stood for 120 years. 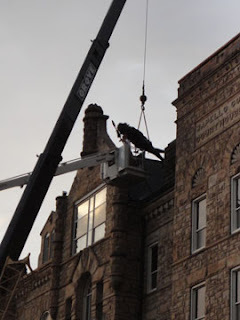 The statue of Chief Wapello, for whom Wapello County, Iowa, was named, used to stand on the tall peak just to the left of the crane arm (above). 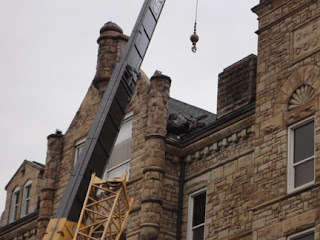 During the storm, the statue tore loose and slid down the roof peak to lodge in the valley three stories up, head aimed toward the street, with nothing much holding him there. 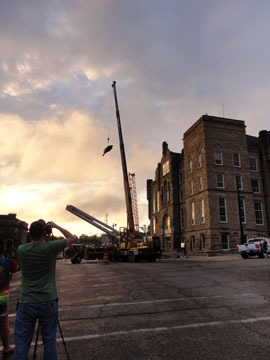 After much maneuvering, the crane operator gently lifted the statue free and swung him to the ground as the storm clouds gave way to a beautiful sunset.